The judicial branch of the American government is headed by the U.S. Supreme Court. There is no other court established by the Constitution of the United States. Any decisions that the U.S. Supreme Court makes is, in most cases, important to the entire nation. The motto of our Supreme Court is "Equal Justice Under Law." Because the words in the Constitution are so difficult for most people to understand, it has to be examined and studied very carefully. When there are any questions about certain laws in smaller courts, Supreme Court justices must interpret and explain the Constitution. Every other court in America has to follow whatever decisions or rules that the U.S. Supreme Court justices make. The Constitution gives our Supreme Court the right to judge whether local, state, and federal governments are following the law. This court also has the power to decide whether or not the president has made an unconstitutional action. Anything the U.S. Supreme Court decides is final, however, any judgments made in any lower courts can be questioned or appealed, The U.S. Supreme Court receives thousands of ruling requests every year but less than 150 of those are considered and decided upon. The U.S. Supreme Court has a head judge, or chief justice, and eight associate justices. It is the highest court in the United States. The president appoints the justices and the senate votes in order to approve them. Unless they make a decision on their own to retire, they serve the Supreme Court for life. Their main job is to help everyone understand any laws that congress passes. There have been over one hundred justices since the United States government was first established, and until 1981, all of them were men. The first ever woman appointed to the U.S. Supreme Court was Sandra Day O'Connor. During most of her service to the U.S. Supreme Court, she was considered a swing vote. She retired in 2006 and Ruthe Bader Ginsburg became the second woman appointed to the U.S. Supreme Court in 1993. Every year, lawyers in the thousands, from all around the country, visit the Supreme Court of the U.S. in hopes to plead their case. Those cases considered to be the most important are the only ones that are ruled on. The important cases tend to be any concerning civil rights and basic freedoms which are protected by the U.S. Bill of Rights. There are times when the decision that is made by the court is so important, the entire country pays very close attention the ruling. In 1954, the U.S. Supreme Court ruled that racial segregation (separating white and black people) in the public school system was unconstitutional. The outlawing of this type of school separation was written by Earl Warren, the Chief of Justice. This decision affected schools all around the United States and this one decision helped pave the way for other laws regarding civil rights being passed in following years. There have been many very important cases throughout history. Plessy vs. Ferguson was a case that addressed racial segregation. Miranda vs. Arizona was a case in which the Supreme Court ruled that any person who is a suspect of a crime must be told about their rights before police officers can question them. One of the most recent Supreme Court cases is the national Federation of Independent Business vs. Kathleen Sebeliu, Secretary of Health and Human Services case in which the Supreme Court sided with the president's health care law. 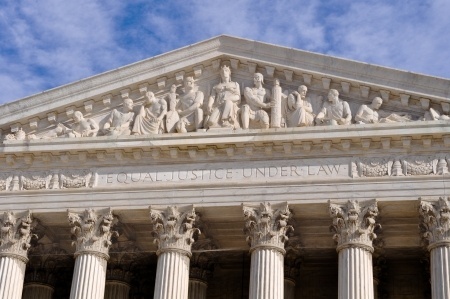 Visit our criminal lawyer to learn more about the supreme court and important cases. The Supreme Court: What Does it Do?